If your dental problem includes missing teeth, dentists all over Australia will give you dental options like getting dental crowns, bridges, dentures, and the most expensive, dental implants. Though it is the most costly, dentists would still recommend dental implants as the solution of choice for missing teeth. Let’s find out the dental implants price comparison against these treatments to get the best option to suit our needs. Before the development of dental implants, dental crowns and bridges were tight contenders when it came to tooth replacement. A bridge is a dental prosthesis used to make up for a space created by one or more missing or lost teeth. The dental device is attached to the neighbouring natural teeth and fixed with cement, creating a ‘bridge’ to achieve a full and natural-looking smile. But, this is just a temporary solution and is the same with dental crowns. Also, dental crowns and bridges are either attached to a misshaped or cracked tooth (crown) or a neighbouring tooth (bridge) to perform its function; disadvantages in using these restorative procedures are aplenty. A dental implant, however, is a permanent tooth replacement solution that doesn’t interrupt with neighbouring teeth. It is the most natural-looking artificial tooth since it is surgically connected onto your jawbone, mimicking the same connection your natural teeth have. Now, let’s talk about the dental implants price comparison against these two dental options. A dental crown can cost you up to $1260 to $1945 depending on the material used. Meanwhile, a dental bridge in Australia can cost you about $1200 per tooth and can cost up to $5000. 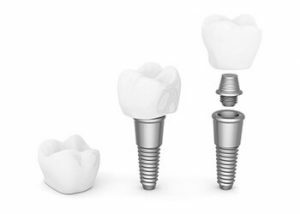 Compare these to dental implants’ average cost of $5000 but are ranging from $3000 to $6500 per tooth, they may definitely sound better. But remember, you also have to weigh other factors like durability, aesthetics, and efficiency. Denture placement is the frontrunner teeth replacement procedure most adults used back in the day when dental implant studies and research were still ongoing. We know they are popular because we see older people wear them; some even inject comedy while using them. There are certain advantages and disadvantages that we can see in using dentures. It is non-invasive, unlike dental implants, in that they are placed on top of the gums. They are removable, and this cuts both ways. The upside is the procedure leading to its usage is nonsurgical; dental implants need surgery. The downside is it is aesthetically unappealing, making your teeth replacements look too artificial and noticeable. With dental implants being permanent and fixed to your gums, you can treat it like most of your natural teeth, and very few can know the difference. Having dentures and dental implants price comparison is unnecessary; we all know that dentures are more affordable. Compare the average cost of dentures from $1200 (ranging from $950-$1990) to that of the dental implants; we clearly have a winner price-wise. But what about other factors as mentioned for the dental bridges and crowns? They, too, should also be considered before deciding as to what tooth replacement procedure suits you best. So, dental implants or other restorative dental procedures? Make this important decision after consulting with your dentist. He or she knows your dental health and condition best. Your dentist also has the appropriate tools and knowledge to guide you through what’s best for you. The cost of a dental procedure doesn’t dictate its efficiency. Let your dentist’s recommendation and your overall dental health take charge of your decision.